Microsoft just posted a succinct, accurate description of the new 'Semi-Annual Channel' terminology, but there are a few important loose ends. Unfortunately, life’s a little more complex than that overview. At the risk of waxing when I should be waning, let me tie some pieces together. If you’re running the latest version of Windows 10 Pro or Enterprise, you can choose to delay updating to the next version of Windows (1709? 1710?) until Microsoft declares the new version is ready for business — what we used to know as the Current Branch for Business, generally expected about four months after the new version hits the limelight. Except there is no Current Branch for Business anymore. So how do we, as Windows users, figure out when we’re going to get upgraded to the next version of Windows? It's a rather pressing question because the new version should be out in a couple of months. With each Semi-Annual Channel release, we begin deploying right away to targeted consumer devices and gradually ramp up to full deployment based on the telemetry that we receive. As John Cable discussed on the Windows Experience blog, we recommend that enterprises follow the same approach. Start with targeted deployments to validate that apps, devices and infrastructure used by the organization works well with the new release. When that validation is complete, begin broadly deploying. Windows 10 1703 is ready for that broad deployment. As best as I can tell, that was the formal announcement that Windows 10 Creators Update, version 1703, had reached Current Branch for Business status. For those who had the analogous “Defer feature updates” setting turned on in 1607, that sudden change came as something of a shock. In addition to issuing that announcement of change in status, Microsoft updated its Current versions list by adding a “Microsoft recommends” on the right (screenshot) of the 1703 entry. You’ll notice that all of the other entries are identified as CB, CBB or LTSB. None of those branches exists anymore. Unless Microsoft changes the terminology in that “Choose when updates are installed” dialog in Win10 1703, by the time 1709/1710 rolls around, there’s going to be a discrepancy between what you choose on the screen and what you get on your machine. Again. But all of this will be better in the next version of Windows 10, 1709 or 1710, right? Microsoft will surely have sorted the terminology out by then, to make things consistent between the announcements, the documentation, and the product itself. Right? Well, maybe not. Here’s a screenshot of the latest beta version (build 16257) of the Advanced Options screen. 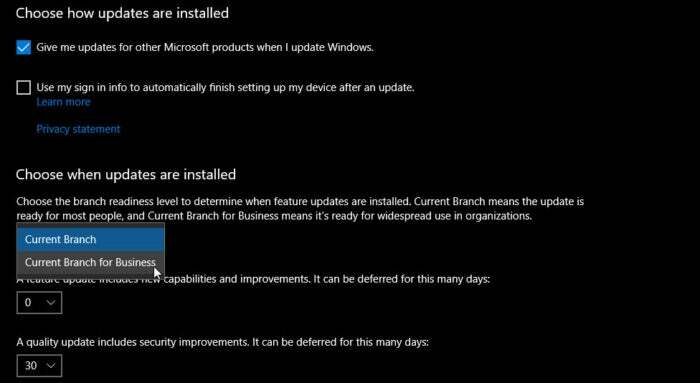 There’s no mention of moving to Current Branch for Business, no indication of how to set your machine to the “Install when Microsoft Recommends” branch. Perhaps we're going to lose that option, even in the Pro edition. Microsoft’s naming changes have confused the living daylights out of everyone. Or at least they’ve confused the living daylights out of me, and I’ve been following the vagaries of updating since Win286. The new, simplified approach would be fine, but there’s no specific name for what was once called CBB, and no way to line up what’s in the Windows interface (1703 or 1709/1710) with what appears in the announcements, or the documentation. I guess we’ll continue to muddle on through. Grumble, grumble. Discussion and consolatory drinks all around on the AskWoody Lounge.